I’ve been in a somewhat rhythm with cooking meals, grocery shopping and stocking a pantry/fridge for almost 7 years now since graduating college. I say that because I think it can feel defeating when you’re beginning to do some meal planning and cooking and it feels hard. It still feels hard for me sometimes! And my definition of cooking has continually changed depending on how crazy life feels. As I’ve moved further along into this journey of intuitive eating, it’s been a lot of trial and error to figure out what works well for my schedule, wallet, and taste buds. Ideally, I’d eat every dinner out or at least pick up Whole Foods hot bar. That would be awesome for my taste buds and schedule, but not financially sustainable. I also don’t have time to cook a new dinner recipe every night of the week. Hi, stress. That would also be good for my taste buds and better for wallet but not my schedule and sanity. So what I’ve landed on is a mixture of all the above. And what I’ve learned is that intuitive eating and some loose meal planning can go hand and hand. Intuitive eating doesn’t necessarily mean always having the most satisfying, craving worthy food at every meal. I think it’s a journey in discovering what foods you enjoy and then making meals that include those foods and flavors. I’ve found this way I can satisfy 70-80% of my cravings with meals and then snacks are where I feel most intuitive with choosing foods I’m hungry for and craving. 1. I’ll peruse some cookbooks and Pinterest if I’m looking for new recipe inspiration. Or if it’s a busy week then I think about what I’m craving and just pick something I’ve cooked before that’s easy and familiar. 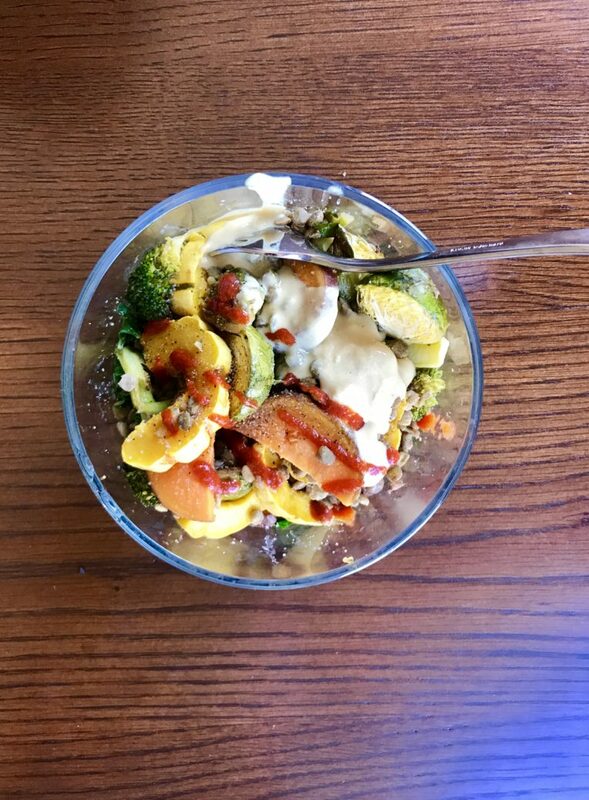 Some usuals are enchiladas, burrito bowls, “unstuffed” cabbage rolls, green curry, and stir fry. Then I write down what I need to buy for that recipe, doubling all the ingredients. I almost always freeze 1/3 to 1/2 half of a dinner recipe when I make it. It only takes a few weeks to have three different dinners frozen in the freezer. 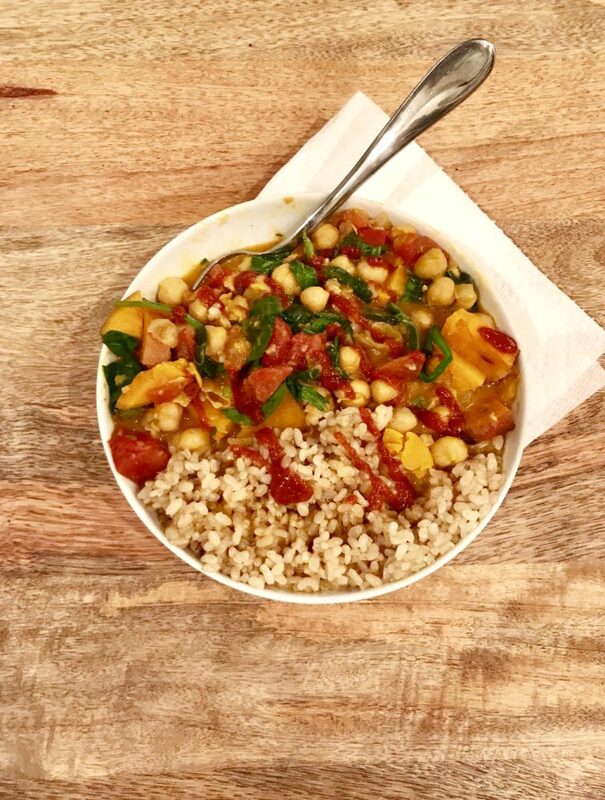 Last week I made sweet potato, spinach and chickpea curry and froze half. Then I cooked up a few nights worth of brown rice to eat with it. So then in weeks to come you’ll either 1) have dinner in the freezer when life gets nuts and you don’t have time to cook or 2) you’ll have 3 different meals to choose from in addition to the recipe you cook at the beginning of the week so you’re not eating the same thing all week. We might eat what I made on Sunday for the first 2-3 nights of the week, then a dinner out of the freezer for a couple nights so we aren’t eating the same dinner 5 nights in a row. Or we eat what I made for the week and then mix it up by grabbing Chipotle or grabbing dinner with friends during the week. 2. Again, I look on Pinterest or in cookbooks or dig into the lunch archives in my brain based on whatever I’m craving. I rotate between some sort of salad, sandwich or grain bowl. In the winter salads mean a veggie soup or a bowl of roasted veggies because I don’t really crave cold salad in the winter. Salads, sandwiches and grain bowls are super customizable so you can switch up the sauces and add-ins throughout the week to keep it interesting and satisfy your cravings. Use pesto or hummus or mayo on wraps/sandwiches or switch up the dressings or toppings on grain bowls and salads – nuts, dried fruit, cheeses etc. Last week I made grain bowls based on an idea in my own head. I bought a few winter veggies – delicata squash (or use butternut), sweet potatoes, broccoli and brussel sprouts. I roasted all those up with oil at 350 degrees, picked two dressings, and then cooked up chicken and some lentils for two different proteins. Dressings = hummus thinned with lemon juice and olive oil and sriracha + olive oil + sea salt. Or just buy two dressings! I threw the veggies over kale and picked lentils or chicken, heated it up in the microwave and added on one of the “dressings.” I’ll usually always add a handful or crackers, piece of fruit or a larabar to mix it up based on what I’m craving and how hungry I am. 3. I like to make a snack/dessert type thing every week. Mainly because I love baked goods and stuff like that and I get really bored of packaged snacks. At least 75% of the time I’m making banana bread of some variety, but other times I make some energy balls or snack-y cookies. This week I made Alexis’s no bake sea salt peanut butter balls. If you wanted to make these simpler, I would just mix the chocolate chips into the ball mixture instead of melting it and drizzling on top. 4. 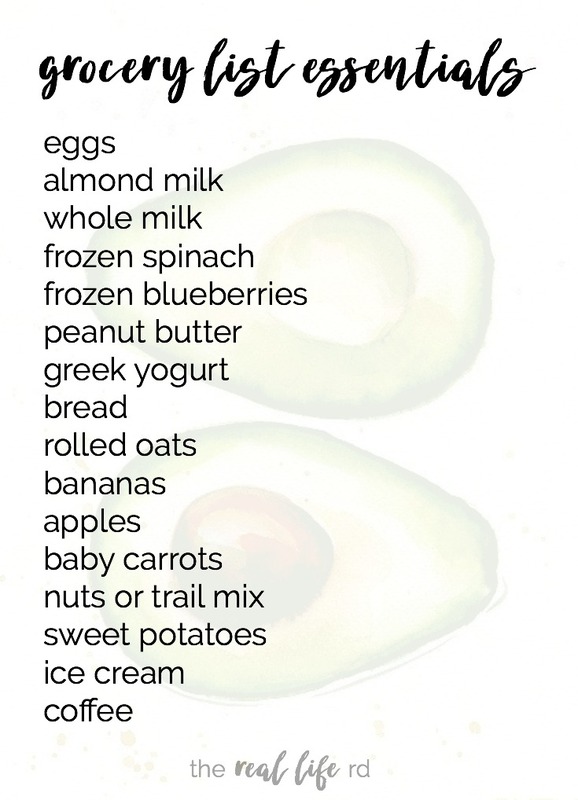 Figure out what your weekly essentials are and stock up on them every time you go to the grocery. 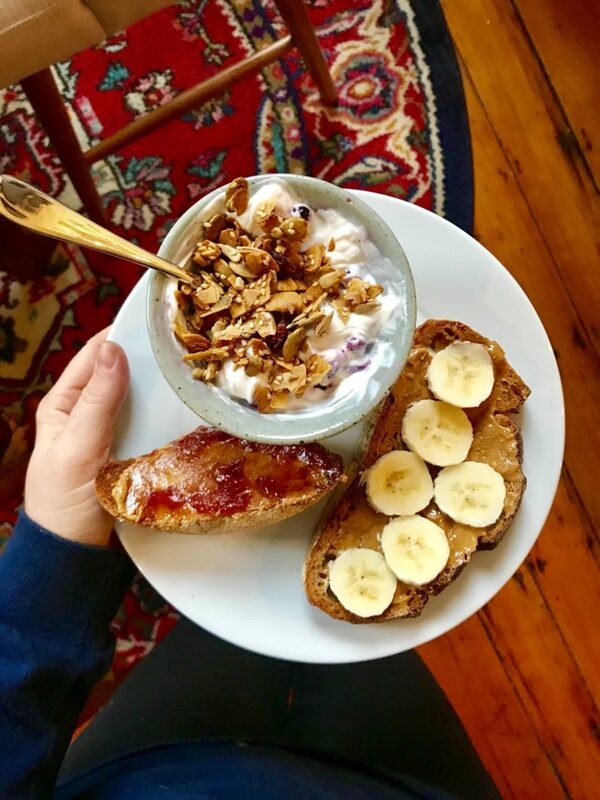 Breakfast is always a rotation of oatmeal, toast with pb or avocado, toast and eggs, yogurt bowls with fruit/granola/nuts and sometimes pancakes if I have time but usually that’s for the weekend. I can make any of these things with our essentials. I use almond milk in smoothies because I use about 1-2 cups of milk in smoothies and have found that much cow’s milk makes me nauseous. I also use almond milk in oatmeal for the same reason. I use whole milk in my coffee and for cooking/baking. Frozen spinach, blueberries and bananas are for breakfast and smoothies. Peanut butter (or almond butter or sun butter) is for anything and everything. Eggs are for breakfast or a quick and easy dinner. In a pinch I fry or scramble eggs, bake a sweet potato and steam up some kale for a quick lunch or dinner. Sweet potatoes keep for months in a dark, cool place. Apples are for lunches and snacks and also keep for several weeks in your fridge. Nick snacks on baby carrots like a horse 🙂 I eat them sometimes with hummus. Nuts and trail mix are for snacks and breakfast. And ice cream + coffee are vital to sustaining life and sanity. A FEW THINGS I’VE FOUND HELPFUL.. I usually do my grocery shopping on Saturday after making a list. Picking recipes/meal ideas and making a list takes about 20-30 minutes. Then grocery shopping start to finish is about an hour. I find shopping and cooking in one day is just too much for me. I don’t want to be doing cooking/meal planning for more than an hour-ish at a time or it becomes a burden and then I start getting frustrated because I want to be doing something else. Sunday afternoon or evening I cook. I turn on a podcast or talk to a friend or my mom and cook up the dinner recipe, prep whatever I need to for lunches (roast or chop veggies, cook some grains etc) and make a snack recipe. This usually takes about an hour-ish or 90 minutes. Sometimes 2 hours but that’s rare. I only shop at one store. In both New York and Boston I’ve found the the most affordable store aside from Trader Joes to be Whole Foods because we don’t have Krogers which I find the most affordable back home in Indiana. Trader Joe’s doesn’t usually have everything I need and their produce can sometimes be hit or miss. 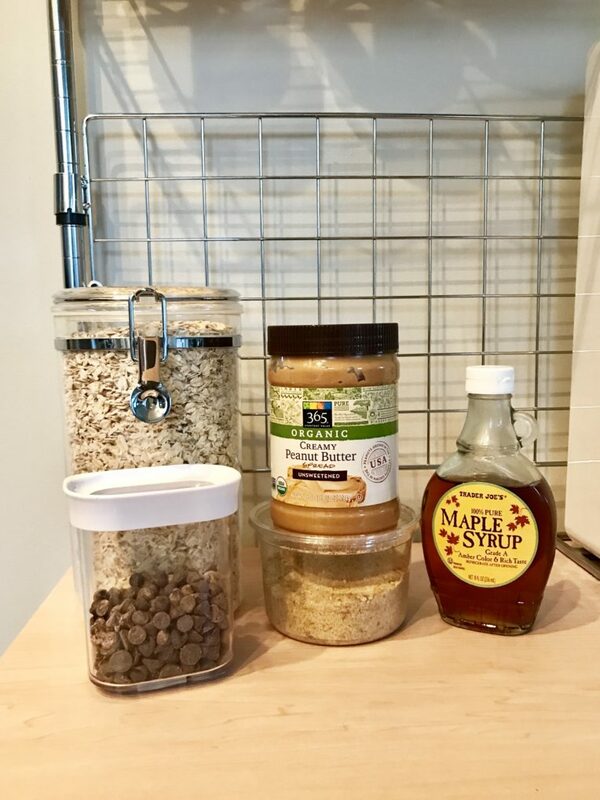 I make one TJs trip a month to stock up on dry goods and oils and nut butters but I’ve found shopping Whole Foods 365 brand and the bulk bins affordable. And now that Amazon has bought Whole Foods, prices are way lower on every day things like potatoes, avocado, bananas etc. It’s less stressful for me to just pick one store and maybe pay 10% more overall vs going to a few different stores. Although coming from a single mom of five, I am thankful to even have a choice in that. I know budgeting is so so personal and some people allocate more money towards some things and less money towards other things. 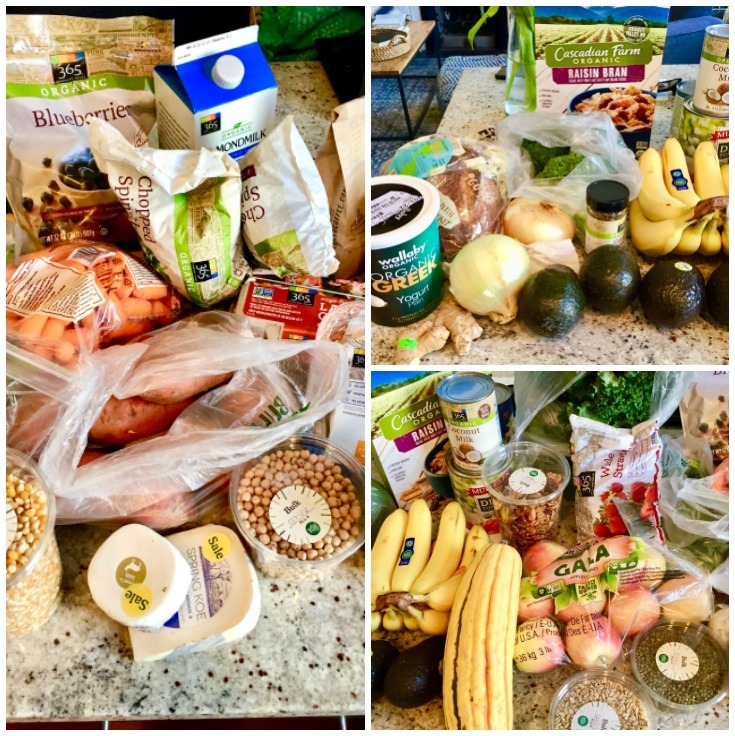 For us, I try to keep groceries under $140/week for two people with pretty big appetites. Most weeks, we eat out about 2 times a week when we spend this much – usually one nicer meal and then something casual like takeout. Be flexible. Life is messy. And sometimes shiz happens and you don’t grocery shop or cook or meal plan. That is okay. Life goes on. Those weeks we eat a lot of eggs and potatoes. Or boil up some pasta with olive oil and sautéed greens. Or we order takeout or grab Dig Inn and readjust the budget in other places. Life happens. I hope this is helpful. I by no means have this all figured out so share your tips and things that work for you in the comments! And of course, any questions…ask away! 5. Save the menus in a folder so that I can spend less time overall meal planning in the future! I love this idea about recording how much time it took to make for further use and saving menus based on your week. So helpful! Hi Robyn, this is great! I also feel like I have spent most of my 20’s trying to get into a good rhythm with meal planning when life seems to be constantly changing. I’m still trying to get a good handle on meal planning/cooking for two after so many years of it just being me and just having to take my preferences into account. Thankfully, I also have a significant other who is (usually) not picky. What I’ve found works best for us in this season of life (living in a NYC walkup apartment!) is do a rough meal plan for an entire month of about 7-8 dinners. I find that meal planning for a month doesn’t take much longer than it takes me to do it for a week, and I make sure to have a good variety of types of meals. Then, every month or so we do a hugeeeeee Trader Joe’s trip where we stock up on what is needed for all of those meals, plus our lunch and breakfast staples, and get it all delivered (totally worth the money when you don’t have a car!). We just supplement with smaller trips every week or so for staples we run out of (milk, eggs, etc) and fresh produce, as well as anything we might be craving. Since starting to do this a few months ago, grocery shopping, cooking, etc. has been so much less stressful! I’m still working to fine tune everything, but it’s a start. 🙂 We also usually eat out 2x a week (and budget accordingly) so that helps mix it up. Yes! I second this going to the grocery store less! We shop every other week, or twice a month and I absolutely refuse to step foot in a store in between unless it’s absolutely needed. I believe I have saved so much more money being able to cut down on trips to the store where I’m tempted to buy things I don’t need. Great tips! 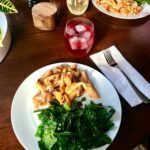 I love this an I have to say, I actually LOVE meal planning and learning others’ strategies. Mine is very similar to yours in that I try my best to make weekly nights as simple as possible. We also utilize freezing meals, though most of the time I use these for my lunches at work. I also make use of the cook once, eat twice method, which has me only couple a couple of nights throughout the week. We almost always have things like sandwich meat/bread, eggs, cereal, oatmeal and things like that on hand in case life gets crazy. We’re not so pick that we can’t make a bowl of cereal be dinner sometimes if that makes life less stressful. One thing I also do is use Kroger’s Clicklist program and I only grocery shop every 2 weeks. I plan most things that can be frozen in the freezer for the second week. Steamable bags of veggies are a lifesaver. We have fresh foods, too, but I just make sure and plan to do something with them the first week before they begin to go bad. We eat out approximately once a week to give us a break and a date night together. Loved reading this, so interesting! I love these posts! Getting inside other people’s kitchens is always nice inspiration for my own meal planning (well, usually). Is it weird that I like to check out other people’s carts in the grocery store for this very reason? Like, what do you have that I might want to try?? Meal planning has been stressful lately– I’m 16 weeks pregnant and NOTHING sounds good EVER. I’d love to hear how Cody managed this during her pregnancy and if it’s something that ever gets better! I usually ate like you (like, exactly– eggs as a catch-all meal, cook a big batch on Sundays, roast up veggies, a grain, and a protein for lunch, etc.) but MAN are we struggling with this lately. Playing it completely by ear by having some basics in the house that we know work (eggs, very basic stir-fry materials, oatmeal, etc.) has been the only way to get some food in me these days. Life = curveballs and seasons, as you said! Food will be good again! When I was pregnant, my only goal was to get the hungry people fed. My regular appetite and desire to cook came back in the second trimester. HAng in there mama! Love these tips & the practicality! I feel like so many bloggers live in a false reality of time/money spent on eating healthy. It’s refreshing and helpful to hear a realistic approach! In theory, buying all those specialty foods sounds great but when I do add kombucha, goji berries, juices, dried beet chips etc to my cart my grocery bills FLIES through the roof…gotta stick with good old veg, proteins and some grains..the basics work well too 🙂 glad you found it helpful! I know exactly what you mean by picking one store to shop at; I love that idea. For our family it doesn’t quite work to do that, but if I were living by myself or married with just two people to feed, I think I would do that! 🙂 And I also love how you’re both planning and flexible in the way that you do your meals; you don’t seem to be obsessed over having certain kinds of meals, but you have structure and planning so you don’t end up with nothing to eat. I probably don’t plan well enough, as certain loved ones have told me, and this is reminding me that planning with spontaneity and flexibility is a good thing! My mom shopped at several stores with a family of six so I’m sure that will change when our family grows! I’m grateful for now this working for us. Glad you found it helpful! I love the idea of mixing up protein with other stuff to create different meals! 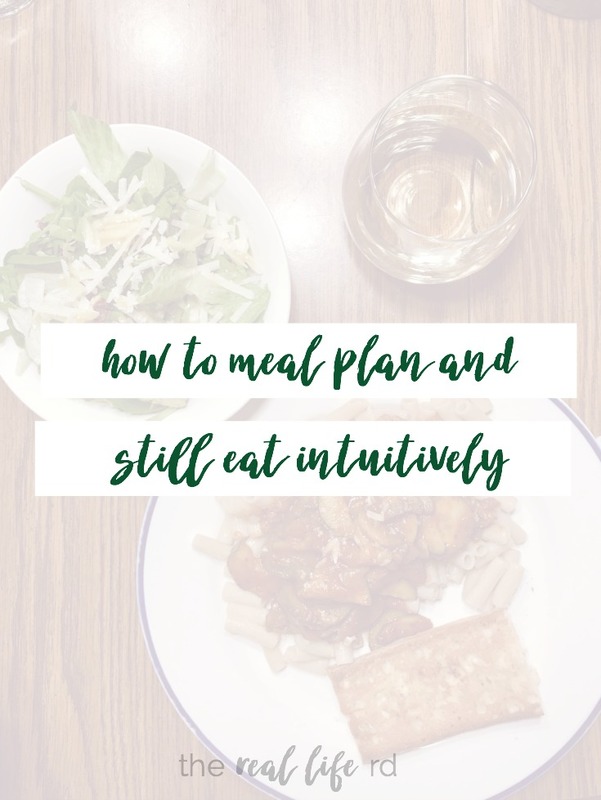 This is something I’ve been struggling with lately – wanting to be more intuitive, but also knowing I have to plan ahead if I want to eat something other than cereal/scrambled eggs every night. To your point, I find that prepping a grain each week (rice, quinoa), roasting a lot of veggies, and picking a dinner meal (usually something in the crockpot with a protein) works well for us. Between all of these things, I can mix/match. Snacks is where I’m looking for inspiration – I’ve been buying 2-3 macrobars a week and rationing them, or I do an apple/PB at work. 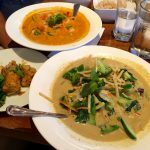 I’m always looking to cut down our shopping budget each week – we haven’t been going out to eat lately, so I think it’s kind of high at first glance, but maybe not so much because we aren’t eating out. Loved this post! For snacks I love yogurt + granola, popcorn, dark chocolate and homemade trail mix with nuts, dried fruit and cereal. Hope that helps! Like you, I always grab our staples which is just Greek yogurt, carrots, and bananas. Throughout the week I add to the list based on the Hy-Vee sale ad. I also jot down random meals that sound good based on what’s on the list and what I know we already have in the pantry, fridge and freezer. It works for us! I also have the good fortune to get free lunch at work which is extremely helpful! I wish we had a Hy-Vee close, I’ve heard people rave about that! Ohhh free lunch – WINNING. Talia over at Work Wekk Lunch just wrote several posts about intuitive eating and meal prep. 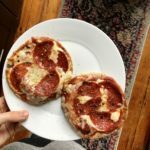 I also found Cody’s post about “Meal Planning When Life Feels ‘Messy'” helpful. As always, thanks for the great content you post. I also hate leftovers, but it’s so hard to cook for one! When I’m on my own for dinners I usually end up eating a lot of stirfry. still cook stir fry a lot when it’s just me! Totally into the “loose meal planning” as well! It definitely makes life less stressful for me. Lately I have been making a big batch of crockpot chili and freezing half for the next week. I also use our rice cooker a lot which saves so much time! chili freezes so well! I’ve been cooking grains in the instant pot and loving that too – I’ve heard people rave about rice cookers! Wow Suzanne I admire you!! I don’t have kids yet but can only imagine this is quite the job! What is your approach regarding evening snacks? I know you have a bed snack every night and was just wondering. Do you buy 1/2 tubs of ice-cream each week for that purpose and then decide? i’m currently recovering from BED with IE and snacks are a grey area I am not sure how to dal with! Meaning buying a few different flavors of ice cream? If so then yes! We usually have a few tubs on hand for variety and as an option for a night snack to be ice cream. Sometimes it’s other things but ice cream is always in the fridge. having it always there and available was a huge step for me to not feel so out of control around it. hope that helps and I’m thinking of you in your recovery! Time and grace 🙂 Thanks! Having a little bit every day seems to be helping so will be continuing with that! In my experience, I’ve found that to be the case to get everything we need in one swoop. Money is personal so do what works for you – and of course if you have ideas share them! I love these tips! I love to cook (and eat!) yummy recipes throughout the week, but I’m a single lady so I have found that cooking a different meal every night isn’t feasible for my budget or sanity. I usually “cook once and eat twice” that way I still have some variety, but also don’t have to stress about cooking every night! Agreed with cooking for one – love that philosophy Miley! This was a great piece, thanks Robyn! 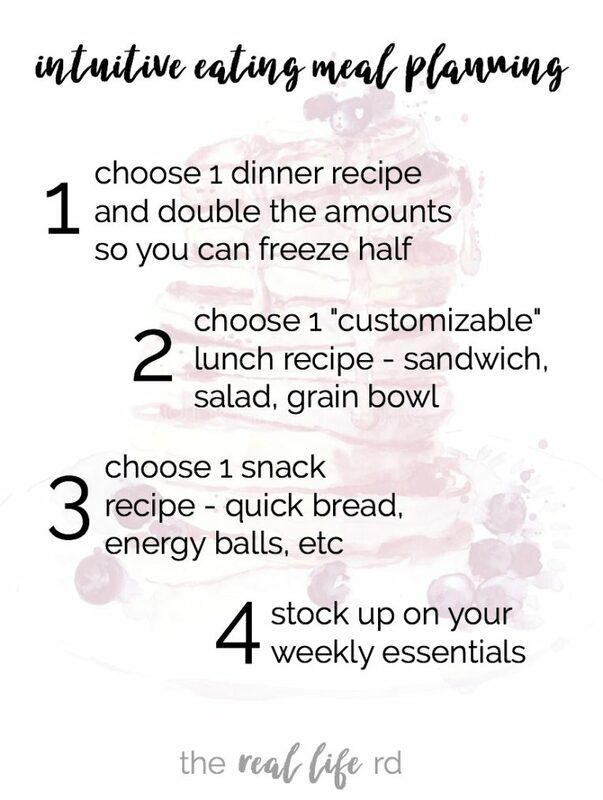 Currently in grad school right now, so trying to manage to save money and time by meal prepping while also trying not to restrict my diet too much- great tips and reminders. Glad you found it helpful Ally! This was an awesome post Robin!! Part II – go-to recipes?? I love this post so much! I have 3 small kids and have really had to hone in on my meal planning/prepping/budgeting skills in the past few months. I like to base my meals around simplicity and don’t really use recipes. Soups are my go-to’s in the winter and they’ve been super easy for my 8 month old twins to eat as they ease into foods (I try to keep it simple by feeding everyone the same things). I always have ingredients on hand for me to whip up: lentil soup, black bean soup, chicken sausages or tofu w/ rice + veggies (like a stirfry), sheetpan roasted veggies + chicken, some kind of bowl with beans + grain + veggies. For breakfast, I make a huge batch of steel cut oats on Sunday and we heat that up throughout the week. My lunch go-to is either leftovers or something like quesadillas, boiled eggs + rice cake + steamed veggies, mish mosh of whatever we’ve got in the fridge. I try to keep it interesting for my toddler. Anything with minimal prep or that I can prepare incrementally throughout the day is my jam. I shop from 3 stores all within a close radius and I buy on sale always (I usually go once a week on Sundays). I stay flexible for that reason. I don’t commit to different veggies for a specific recipe, I just do what I can with what is on sale. I love finding bargains and stocking up when prices are good. I use the Ibotta app and it’s earned me so much money back. The more I pay attention to prices, the easier it gets to learn where/when to buy what. It makes a huge difference in our budget. Thank you for the beautiful post, Robyn. I always enjoy what you share. Thank you for inspiring and leading. Love this post. 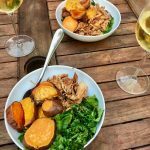 Great to see how you apply intuitive eating with meal prep. I often have clients that have a heard time grasping that the two can actually coincide. My weekly staples are very similar to yours. I like the idea of freezing part of the meal for later. We usually cook dinner meals 4 nights a week and each have leftovers for lunch the next day in some way but your way breaks it up a little. Hey, Robyn! I love this post so much. Thank you! Question: What is your favorite way to freeze meals? Do you have good plastic containers or do you buy the metal ones, etc.? I’m excited to try this out next week as I realized that I have not been eating well for me these last few months. I have been losing balance and my blood sugars (I have type 1 diabetes) have been on a roller coaster. Thank you for this valuable resource so I can bring back in meal planning in a more healthful (not obsessive) and satisfying way. Thank you for this inspiring post! I am curious, however, do you still marathon run/endurance run? I know way back when you were and wondering if your intuitive eating still keeps Aunt Flow around while partaking in this exercise. I love to be active due to the rush of endorphins but sometimes feel even with shoveling food, my body is sensitive to stress. Thanks! I don’t right now in this season of life. I have ran some half marathons and 1 marathon in the past 3 years and IE has kept my period still regular – but part of IE is having the head knowledge and skill of knowing how to support your body with enough energy and carbs when your activity is high. but YESS everyone has a different exercise threshold that is healthy for THEIR body and it depends on other factors in life. Hope that helps!! Thanks for your input Robyn!